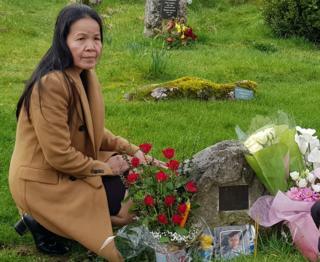 The relative of a Thai woman who was finally identified 15 years after being found dead in the Yorkshire Dales has said she "broke into tears" when she visited her grave for the first time. Lamduan Armitage, nee Seekanya, was discovered near Pen-y-ghent in 2004. She was named The Lady of the Hills because her identity was unknown and buried at St Oswald's Church in Horton-in-Ribblesdale. Buathong Trimble said she was "speechless" upon arrival at the site. Visiting her grave on Saturday, Mrs Trimble, who is Mrs Armitage's first cousin once removed, said: "I was saddened, I felt sorry for her. "I couldn't help breaking into tears. "I told her, 'my dear, not so long and you will get to go home, your parents are waiting'." Mrs Trimble said she had been "shocked" to learn that Mrs Armitage was identified as The Lady of the Hills. "I cried a lot, I couldn't sleep," she said. Mrs Trimble said she wanted to "thank everyone on behalf of her family" for looking after her relative, and added that Mrs Armitage "should rest in our local temple" in Thailand. Mrs Armitage's half-naked body was found face down in a stream by walkers near Pen-y-ghent on 20 September 2004. But in January, Buasa and Joomsri Seekanya, from Udon Thani in north-east Thailand, came forward to say they believed the woman was their daughter Lamduan after reading a BBC story about the case. The family said they had not heard from her since 2004. Police finally confirmed her identity on Tuesday after extensive inquiries and DNA testing with family members in Thailand. Mrs Armitage moved to the UK in 1991 after marrying her husband David Armitage in Thailand, and lived in Portsmouth, Rugby and Preston. North Yorkshire Police are now investigating her death and want to speak to anyone who may have known her or her family. Detectives, who believe she could have been a "Thai bride" and may have been killed, are looking to interview members of Mrs Armitage's family and carry out further inquiries in Thailand in due course.